You know how it is-you think you've saved the world, and then ANOTHER evil villan turns up with an unbeatable monster and starts breaking things. *SPOILERS!!! SPOILERS!!! This review contains spoilers for people who have not read the book. Valkyrie Cain, a sidekick to a detective, Skulduggery Pleasant; a living person...well if you don't count that he is only made up of bones. Now that Valkyrie has defeated Serpine and saved the Sanctuary. But now that's done theres a new villain. The short story: Valkrie and Skulduggery needs to defeat Baron Vengeous and stop the unbeatable monster; which has a part of the faceless ones. This post is about skulduggery Pleasant book 2 and a mix of book 1, because i just love this serie. This Skulduggery Pleasant eries is all about not reviving the faceless ones. The faceless ones once ruled and people didn't like them. Valkyrie Cain was once known as Stephanie Edgely. In book one her uncle Gordon is dead and that's the trigger where she knows of Skulduggery, magic and all about herself. She finds out that she is the part of the ancient race of mages called the Ancient ones that vanished the race of gods, the Faceless ones. Valkyrie Cain's character is promising for action and danger. I don't know what to think of her but i wanna know what she can do as the Ancient ones mage. Right now the book has only told us that she is part of the ancient race of mages called the Ancient ones but hasn't gone anywhere from that. 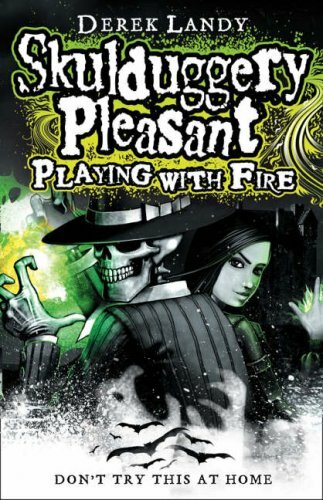 Skulduggery Pleasant is a funny, calm and loving character. He makes jokes, with sarcasm and he's always calm and whemn i mean always it means always. The originality of his character is great. I would love to meet him in real life. His character is also mysterious, because we don't know much about his past and he seems to know everybody. The thing i liked about the book was the idea of having three names. It makes me believe that it is true. In this book it says that everyone has three names. One, the name you are born with and with this name witch, wizard and magical creatures can control you. Two, the name your parents give to you. And three, the name that you give yourself so witches, wizards and magical creatures cannot control you. In Playing with Fire the extra bit that will be stuck in your head forever is the mirror copy of Valkyrie Cain. When Skulduggery and Valkyrie is in a critical point Valkyrie and her mirror copy has to exchange because Skulduggery has to kill Valkyrie in front of people, but after this accident Valkrie's mirror copy has being strange. Somtimes, Valkyrie's mirror copy has its own feeling and thats bad. To sum it all up i think that Playing with fire is an amazing, action packed and hooking book.